Realme launched in Indonesia barely a month ago and it’s already made its second big splash. This one came from the Singles' day sale (11.11) in which the young brand outsold established players like Samsung and Xiaomi. Lazada, the local etailer, had its biggest Singles' day sale and the Realme phones topped the phone segment. The Realme 2 Pro, Realme 2 and Realme C1 all took part, selling a total 40,000 units in 21 minutes. The C1 was the top seller during the 12 hours of activity. Realme also claims a triple title for the period of November 1-11: the the highest total sales, the highest individual sales and the fastest sales growth. 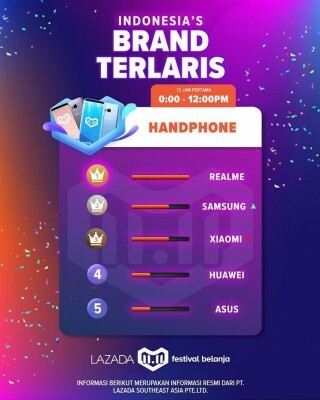 For that period the Top 3 selling phones at Lazada were the Realme 2, C1 and 2 Pro (in that order). It did well in Thailand too - Realme sold 1,000 units in 8 minutes on the local Lazada branch. The success isn't exclusive to Lazada either, the brand broke the sales record of Shopee Malaysia where the Realme 2 Pro moved 2,500 units in 3 hours. Oneplus retreated from Indonesia because of the recently-implemented law stating that phone manufacturers must sold phones with a minimum of 30% of local materials or else they can't sell the phone.